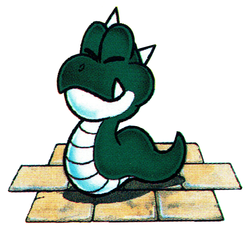 A Snake is an enemy from the Virtual Boy title Mario Clash. They resemble normal snakes except with spikes protruding from their heads. They produce eggs to attack Mario. They can be defeated by having a Koopa Troopa thrown at them. ↑ Mario Clash English instruction booklet, page 20. ↑ Mario Clash Japanese instruction booklet, page 19. This page was last edited on February 26, 2019, at 00:47.